ScottMadden»Insights Library»Minute»Will Nuclear Power Plants in the United States Experience Life beyond 60? Will Nuclear Power Plants in the United States Experience Life beyond 60? After 40 years in service (the initial license period), nuclear reactors can receive a 20-year operational extension through an established NRC license renewal process. Of the 99 operating reactors in the United States, 75 (representing approximately 69,000 MW of capacity) have been granted the 20-year extension to operate for a total of 60 years, 17 reactors are currently undergoing a license renewal review by the NRC (a process that lasts approximately 30 months), and seven more are expected to file for a license extension in the next few years. To operate beyond 60 years, operators must apply for and receive a Subsequent License Renewal (SLR) from the NRC. Receipt of an SLR would enable a reactor to remain in service for a period of up to an additional 20 years, for a total potential operational life span of 80 years. While no operator has officially sought an SLR to date, industry analysts believe the first request will be submitted within the next year. Though there is no question that some operators will seek an SLR in the future, there are others that have a less-optimistic view of nuclear plants remaining in service beyond 60 years. In the March 4, 2015, Senate Appropriations Subcommittee on Energy and Water Development hearing, Senator Lamar Alexander (R-TN) testified that several high-level energy company executives have told him that they will not seek federal approval to extend the operation of their reactors beyond 60 years. While Sen. Alexander declined to name the companies with whom he had spoken, he testified that, “[B]ig utility operators tell me they are not even thinking about asking for extensions of the time their reactors will stay on line…because it is not economical to operate them.” He concluded his testimony by requesting the four NRC commissioners examine whether NRC regulations created “obstacles” to 80-year operations and that the NRC should consider trying to develop a more “welcoming environment” to applicants rather than an “adversarial” one. 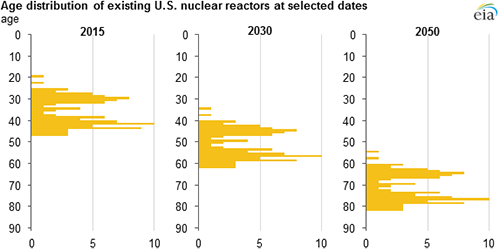 The image below depicts the age distribution of existing U.S. nuclear reactors at selected future dates. 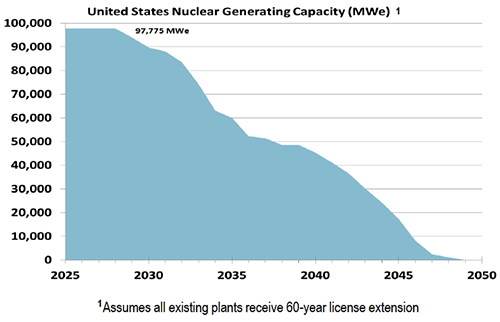 The image below depicts projected U.S. nuclear generating capacity in 2050 (assuming all existing reactors are licensed to operate for 60 years and no reactors receive an SLR to operate for 80 years). This report is part of the Nuclear Minute series. To view all featured Minutes, please click here. The United States has embarked on actions to combat climate change by putting a focus on lowering carbon emissions in the electric generation sector, which includes wind, solar, and nuclear. This white paper discusses the consequences of losing an important part of the electric generation sector: nuclear.